Is Leith Hall in Aberdeenshire haunted? 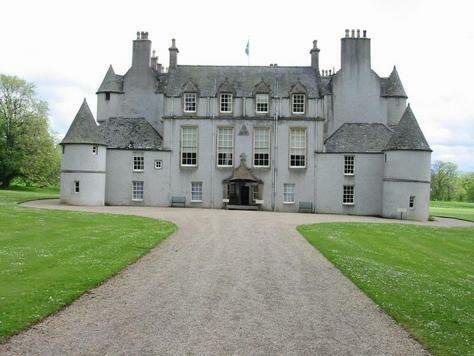 Leith Hall is a manor house, which is situated in the town of Huntly in Aberdeenshire, Scotland. Construction dates back to the mid-seventeenth century (around 1650) on the site of an earlier medieval castle called Peill. The house was updated and extended in 1738, 1810 and in 1904 and most notably, during the first world war became a hospital to over 500 patients. The main ghostly presence is believed to be Laird John-Leith III who was killed on Christmas Day in 1763 in a local tavern during a drunken brawl in which he was shot in the head, after he reacted angrily to a fellow diner who accused him of "adulterating" the grain sold from the Hall. The full apparition of John has been reported a surprising number of times and is said to appear in great pain with a dirty white bandage over his head and covering his eyes, wearing dark green trousers and a plain shirt. In 1968, one unlucky guest awoke during the night to see John in highland dress, his head covered in bloody bandages, standing at the foot of the bed. Needless to say, the guest swiftly left and refused to come back... Other apparitions have also been sighted. Several writers who've stayed at the manor have reported seeing paranormal phenomenon. One of them being Elizabeth Byrd, who wrote about her experiences in her book "A Strange & Seeing Time" and describes the time that she rented the East Wing of the Hall with her husband in 1986.